**Holiday Rate December 15th -January 1st, 2018** Holiday rate is the weekend rate. We are currently renting single and double seat snowmobiles. Our season begins December 1st and lasts until March, depending on snowfall. 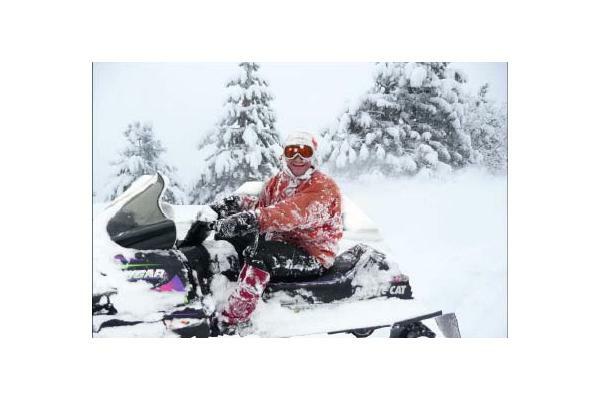 The Lake Wenatchee area is one of the premiere snowmobile areas in the Northwest! If you are staying in one of our 59er Diner Cabins, you can ride directly from the diner to great beginner and intermediate trails. If you are renting a cabin near the Fish Lake Trail System and renting two days or more, we will deliver the machines to you at your cabin and pick them up when you are done. Riding at the Sno Park is a two sled minimum for safety reasons, we have a limited riding area for those riding with only one snowmobile. BE SURE TO DRESS WARMLY AND BRING YOUR CAMERA! A $500.00 Damage Deposit (VISA/MC only) is required at the time of rental. All Snowmobiles leave with fuel, oil helmets and maps. Customer is fully responsible for all damages and is required to sign liability forms and release agreement at time of rental. Minor Release forms must be signed for all minors by a parent or guardian. No children under 6 years of age. All Riders are required to wear helmets. Helmets will be provided at time of rental. Sleds will be rented to adults 21 years or older. Driver's license is required. We ride rain, snow or shine. No weather related refunds will be given. Make sure you bring warm clothing, gloves, and boots. Guides are available, price is determined on a per trip basis. Delivery available for select areas and two day rentals only. Please make arrangements for sled delivery when you make your reservation.